In today’s modern time and age along with our hectic lifestyle, most of us are now dependent on eating processed food, using strong chemically-induced products from head to toe, and to all things that can make everything faster and easier. But as we continue to resort to these things, there will always be a point in our lives where we'll crave to go back to the purest, most natural, healthier versions of ourselves. 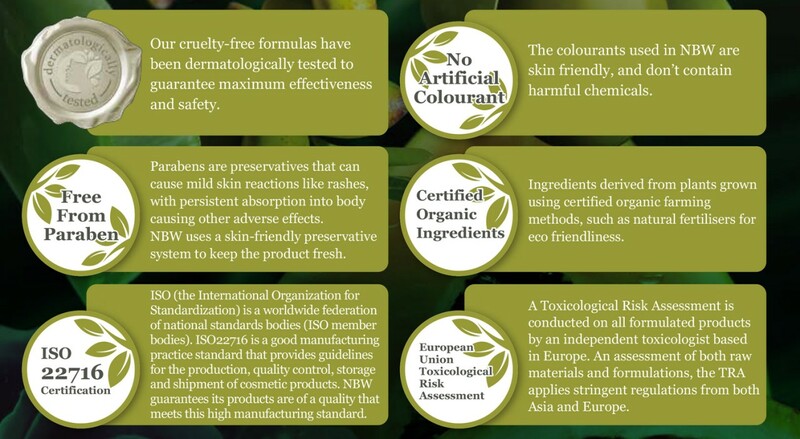 Natural products, in general, have naturally-infused ingredients without the harmful chemicals. Using such essentials will not only nourish and benefit our hair, body, and skin in the most natural form; but we’re also in work to save and protect our Mother Earth as the formulas used are non-toxic and eco-friendly! However, even with all these benefits, most of the natural products in the market are either too expensive, hard to find, or simply don't suit our body and skin. Luckily, Watsons heard our heartfelt wishes as they go natural and launch their line of natural hair, body and skin care goodies, Naturals by Watsons! Made with the finest certified organic ingredients sourced from around the world, each product has “double the power” of its active ingredient to enhance efficacy. Whether to moisturize, soften, brighten, or pamper, every product is tested for complete safety without the harmful chemicals, so you can draw from nature’s essential goodness for that head-to-toe beautifying luxury! Another good thing is, switching to Naturals by Watsons doesn’t come with a hefty price tag. The products are value for money and are also easily accessible to everyone as they are widely distributed in all Watsons stores nationwide, The SM Store Beauty Section, and at www.watsons.com.ph! 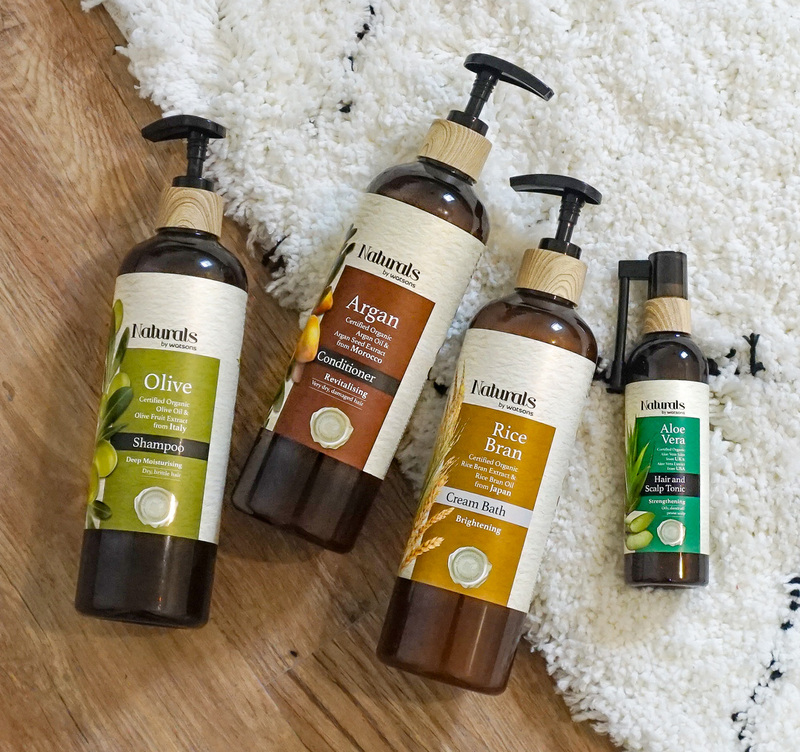 And to finally discover what makes such hype, we brought the essential goodness of nature in the shower with us by using 4 out of their 8 product ranges for 2 weeks. Organic Olive Oil - rich in vitamins and natural fatty acids. Natural Olive Fruit Extract - rich in antioxidants and hydroxytyrosol to restore the hair's vitality. Organic Grape Seed Oil – has antioxidant properties to soothe and protect hair. Natural Abyssinian Oil - restores and repairs dry and brittle hair. Natural Sunflower Oil - revitalizes hair and boosts shine. 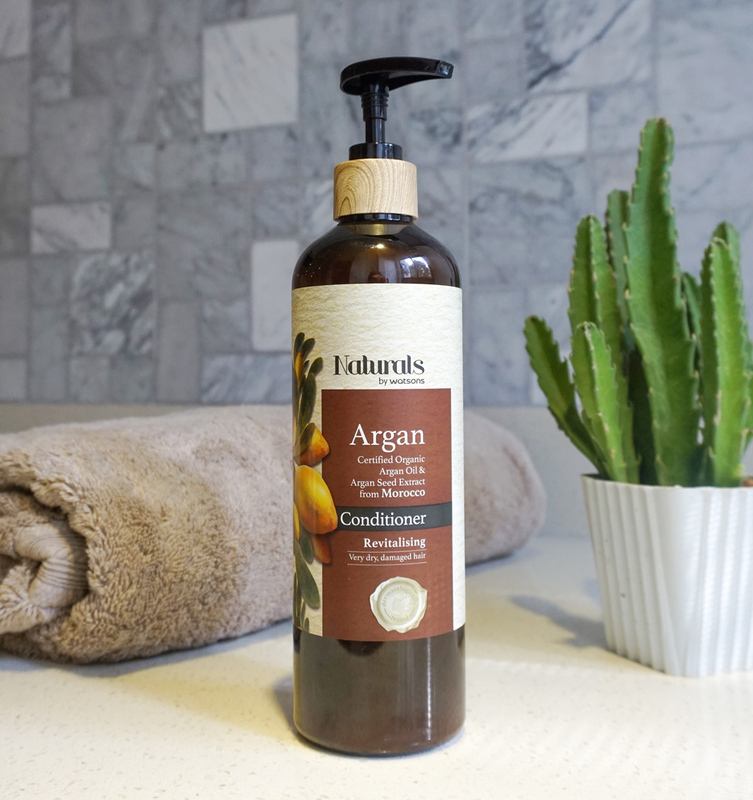 Naturals by Watsons Argan Oil Conditioner is a natural conditioner that, on the other hand, delivers double the power of Argan from Morocco for extra revitalisation of dry, damaged hair. Highly recognised as "liquid gold", it’s no longer a question that Argan Oil nourishes and improves hair elasticity for more resilience. Organic Argan Oil - nourishes and protects hair with Vitamin E and essential fatty acids. Natural Argan Seed Extract - helps boost the hair's moisture and shine. Organic Avocado Oil - moisturizes and nourishes hair. Organic Wheat Germ Extract - contains antioxidants to help strengthen the hair. Pro Vitamin B5 - prevents split ends for more manageable hair. Curious on how they’ll work for my hair, I used both the shampoo and conditioner for 2 weeks. I have a mildly dry, lifeless, brittle (with split ends) hair; because to be honest, I think I got it from colouring my hair and mostly by using strong chemically-infused shampoos and conditioners. But after a week’s usage of both the shampoo and conditioner, I noticed that my hair became more manageable and easier to comb day by day as it has been moisturised well. On the 2nd week, I was even more amazed to see my hair become softer, smoother, and with more life! And my split ends? It definitely lessened! It’s like I received a natural hair treatment just in the comfort of my home. This was my first time having encountered a hair duo that can totally ease my worries about my mildly dry, lifeless, brittle hair! 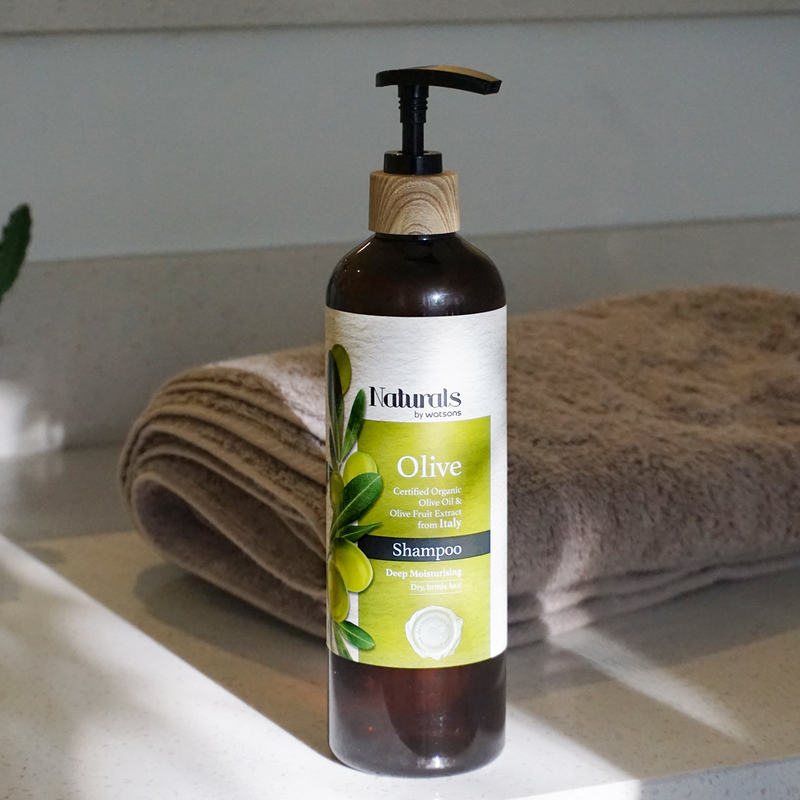 Of course, a luxurious bath time with Naturals by Watsons wouldn’t be complete without some nourishing skin treat from Naturals by Watsons Rice Bran Cream Bath. 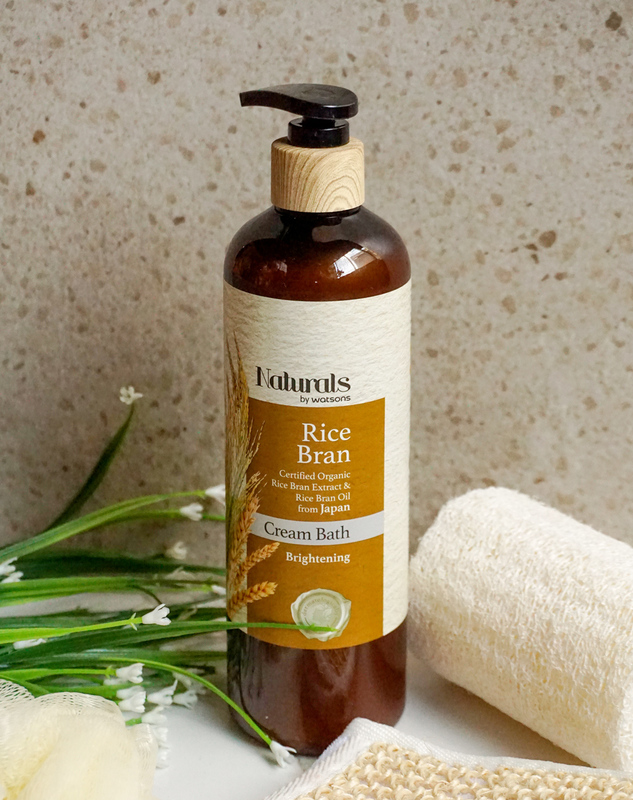 Natural Rice Bran Oil - rich in antioxidants and Vitamin E for healthier and more radiant skin. Organic Rice Bran Extract - has a powerful antioxidant to brighten and rejuvenate the skin. Organic Soybean Extract - helps renew skin and contains lecithin to prevent premature ageing. Vitamin B3 and E - protect against UV damage and boost the skin’s radiance and elasticity. Like the shampoo and the conditioner, it’s free from Paraben, Mineral Oil, Silicones, Colourants, Sodium Lauryl Sulfate, Soap, Isothiazolinone (MIT, CMIT, BIT). Along with the shampoo and the conditioner, I also used the cream bath and replaced my regular soap with it for 2 weeks. I was eager to see how it will even out my skin's dull and uneven tone due to the sunburn that I got last October and of course, with the everyday commute to the office. Upon using it, the first thing I loved is its scent! Then, I enjoyed how it luxuriously lathered on my skin and how it gave off a soft and smooth feeling on my skin. On the second week, I was amazed how it somehow started to even out my skin tone and loved how it made my skin look healthier and with more life! It definitely brightened my skin and made it smoother, softer, and more supple! Plus points that it made the dry white patches on my skin go away. Lastly, the one that's on top of my list -- Naturals by Watsons Aloe Vera Hair & Scalp Tonic. Organic Aloe Vera Juice - nourishes the hair and soothes dry, irritated and itchy scalps to prevent flaking. Natural Aloe Vera Extract - replenishes the hair's moisture from deep down, repairs the skin barrier with conditioning effect. It’s free from Parabens, Colourants, and Isothiazolinone (MIT, CMIT, BIT). Among the four products, this became my personal favourite as I love how it took care of my tresses from roots to ends. 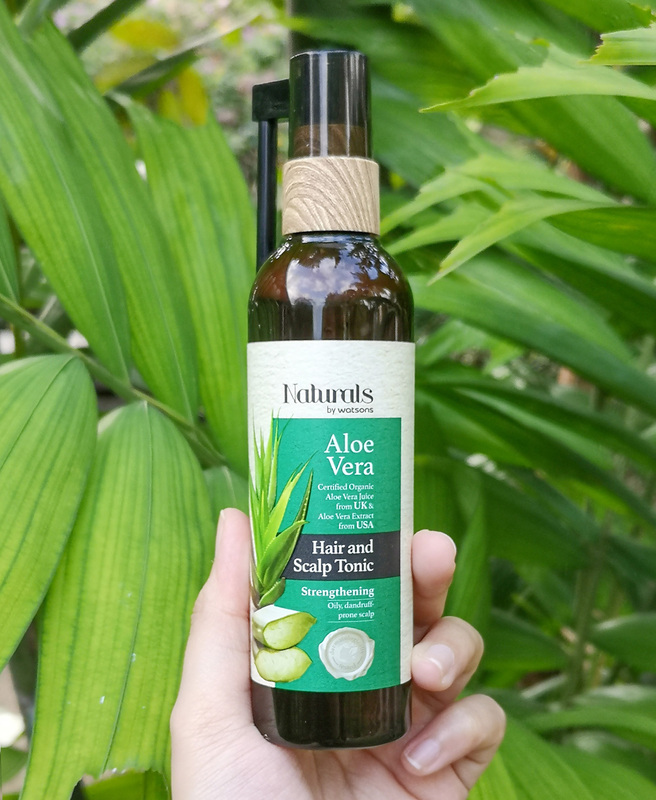 Though I don’t have an oily, dandruff-prone scalp, I still used it to lessen my hair fall and give my hair the overall moisturization and protection it needs. Like most women, I’m always experiencing hair fall whenever I take a bath, comb my hair, or lay in my bed. There will always be several hair strands that I see on our bathroom drainage, on my brush, and on my pillow. From the several products and treatments I tried before, a lot didn't work and those that did work were very expensive. So I was really curious if this product would really make my hair fall woes go away. In my first week of using it, I didn’t see any much improvement yet but it definitely added more life to my hair. There was this "moisture" blanket that covered my hair. It looks so much alive with its every bounce. On my second week, I noticed the difference where there were lesser hair fall in our shower drainage, on my comb, and on my pillow. I feel that my hair strands are now stronger and more resilient to breakage! It was the perfect complementary product to the power duo of shampoo and conditioner! Final verdict: I am 101% switching to Naturals by Watsons! Its beautiful and healthy effects on my hair and skin just made me appreciate and fall in love more with the goodness of nature. Added to the fact that they are also safe, gentle, all-natural, and free from harmful chemicals guarantee me and everyone who uses it that we are responsible consumers who also want to preserve and save Mother Earth and contribute to its sustainability. You may take a look at our short video below on how we started our journey with this blessing from Watsons! There you have it, dear roomies! Naturals by Watsons has greatly changed the game for us to jump into a healthier lifestyle, be a more responsible consumer, and recognize the hidden wonders of nature to keep us naturally healthy and beautiful! Try them all now for FREE here and grow lovelier with our nature’s stunning beauty! Enjoy #NoStickySituations with the NEW Vaseline Healthy White Fresh & Fair Cooling UV Gel Lotion!